Most robots are rigid. Rigid is easy to design, easy to construct, easy to calibrate, and more reliable for all of those dull, dirty, and dangerous tasks that robots excel at. When robots make fundamental structural compromises to rigidity, they do it in complicated ways, like with series elastic actuators or hydraulics. It’s worth it, though, because adding squishiness can make robots both more capable and safer to be around through passive compliance. Taking this concept to the extreme has resulted in some incredibly squishy robots, including soft robots that can walk, and other soft robots that can roll. But in both of these cases, embracing squishy properties means giving up rigidity. MIT has been working on a structure for a robot that offers both: squishy when you want it, and rigidity when you don’t. The MIT approach involves taking a material or structure that’s inherently soft and modifying it with another material that can phase change between hard and soft states. In this case, MIT is using a scaffold made of foam that’s been coated with wax. Wax, being wax, transitions between solid and liquid at a relatively low temperature. When the wax is cold and solid, the foam structure is rigid, but if the wax is heated to soften it, the entire foam structure becomes soft as well. The researchers also demonstrated that by selectively deforming parts of a structure, they could create joints and make the structure move using a cable (as seen in the video). 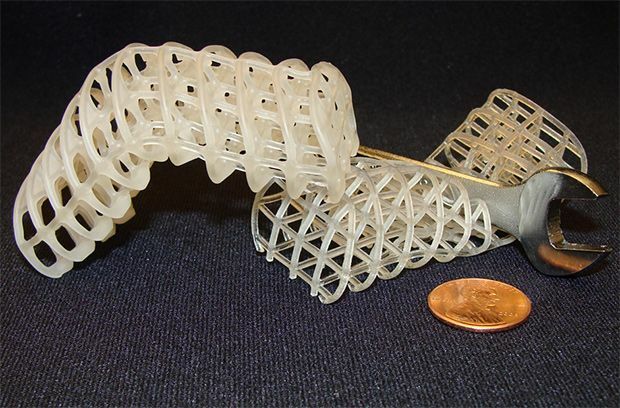 We’re guessing that as a next step several of these deformable structures could be combined to create a robot that can crawl and squeeze into tight spaces. And wax is one of the easier and safer materials to use for this purpose, although there are many other options, like liquid metals or magnetorheological or electrorheological fluids, which respond to magnetic and electrical fields. The project began as a collaboration with Boston Dynamics, as part of DARPA’s ChemBot program (which led to some really cool and weird soft robots, like this and this). The MIT researchers, led by Anette Hosoi, a professor of mechanical engineering and applied mathematics, have since teamed up with the Max Planck Institute for Dynamics and Self-Organization and Stony Brook University to continue developing versatile, deformable robots. The researchers say that robots like these would be ideal for search and rescue scenarios, where you’d need a lot of compliance and flexibility for crawling around and through jumbled piles of rubble. They also suggest that robots like these would be great for crawling around inside your body, where they’d be able to “reach a particular point without damaging any of the organs or vessels along the way.” Thanks for that, we squishy humans definitely appreciate it!